ZeusDraw's important controls are easily accessible without hunting. There are two dockable tool palettes, one for viewing and one for creation/editing. An additional palette holds the controls for the current tool. The primary controls are immediately available, and less frequently used ones are easily accessible in fold-up sections of the controls palette. Zeus has a large set of keyboard shortcuts, but it can also work conveniently using only a pressure sensitive pen and tablet. Download a 30 day trial copy. Quartz and Cocoa let ZeusDraw show you what you are doing as you do it. 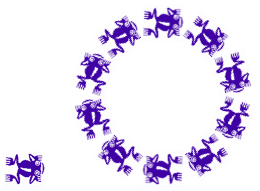 When you move or rotate an object you see the object move or rotate, not its bounding box. When you draw with a brush you see a close approximation to the final brush stroke as you draw, not a dotted line that is filled in later. ZeusDraw has a selection of vector brushes (Smooth Brush, Shaded Brush, Multi-Hair Brush), and it also has an object brush that allows you to paint with any piece of artwork - vector or bitmap. When the object brush is used with a textured bitmap, you can obtain results similar to those in a pixel based paint program. But the brush strokes remain objects - they can be selected, moved, scaled, rotated, or deleted. The brush's path may be modified, and its attributes (type, width, color, and randomness) can be edited with a live (as you do it) display of the results. 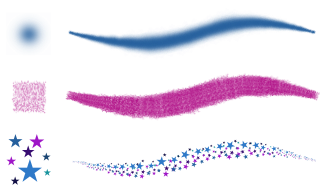 A brush sample window provides a space to try out brushes and see the effects of different settings. ZeusDraw comes with a library of brushes, the means to create and add your own brushes to the library, and a way to save a set of brushes with your design file. ZeusDraw simplifies Bezier curves. With ZeusDraw's path tools you enter control points in order along the path (more logical and intuitive, since the shape of the polygon made by the control points is a rough indicator of the shape of the curve). While adding points to a curve you can go back at any time and move any of the points that you have already entered, making it easy to obtain the shape you want. When editing an existing path, all the points are available for editing - there is no confusing secondary selection tool. 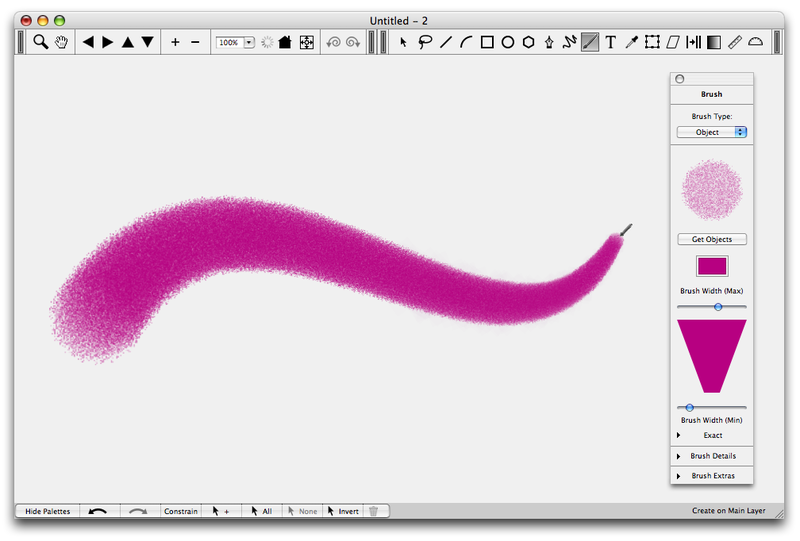 ZeusDraw lets you edit gradients in place, on the the objects they are filling. The live editing lets you change the position, orientation and type of the gradient as well as the number, color and spacing of the gradient colors and see the results as you work. You can also drag and drop colors directly to the gradient. ZeusDraw comes with a version of the Shades Color Picker built in. The Color Chips palette shows all the colors currently used in the design. Changing the color of a chip changes all objects in the design that are that color. The Swatches palette lets you keep colors and gradients with your file, even if they are not currently being used. Using ZeusDraw you enter text directly where you want it, without any “text-box”. 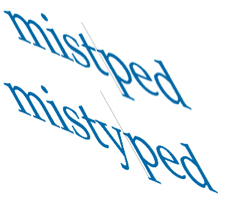 The text can then be transformed (moved, scaled, rotated, skewed) and the transformed text can be edited in place with the text tool. The text can be turned into paths for further graphic modification. In addition to working with normal full-color bitmaps (jpeg, tif, png, gif and bmp), ZeusDraw can use grayscale bitmaps as stencils. 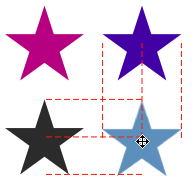 The resulting artwork can be re-colored in the same way as normal vector objects - either using the object inspector or by dropping a color chip on them. 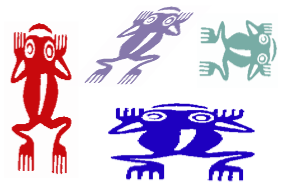 You can use images from clip art disks, like these frogs, or use bits of scanned texture to make interesting brushes. If you open a full color bitmap as a stencil, ZeusDraw will convert it to a stencil for you. ZeusDraw’s Duplicate Tool is used to place or stamp copies of your graphics. It can also be used to drag and drop copies of graphics that you select into other programs such as Mail, Pages and Keynote. ZeusDraw also has Multi-Copy Tools that let you place equally spaced multiple copies of an object along a line, an arc, a full circle or a path as you draw. ZeusDraw has Snap to Grid, but it also has Snap to Point, Snap to Path for precision drawing, and Snap to Angle for drawing arcs and rotating objects. Automatic alignment guides let you line up your art-work by just dragging objects with your mouse. When you are close to lining up with another object, a line appears, and when you release the dragged object, it snaps into place. Draw by gesture or by the numbers. The Transformation Palette lets you move, rotate, scale or offset by by an amount you chose. With the Geometry Inspector you can directly set the size and position of an object. Measure distance and angle with the Measuring Tools. ZeusDraw has a complete set of easily accessible viewing tools including a separate undo for views. You can zoom up to take a look at a detail and then easily return to your original view. ZeusDraw also has a tablet and trackball mode that allows two handed operation when using a pressure sensitive tablet - the pen and tablet function as the pointer in the normal way while the trackball scrolls and the trackball buttons zoom in and out. You can now choose between the CMYK color model or the RGB color model for your documents. You can set the profile (color space) for new documents and control how imported images are matched to the document color space. ZeusDraw now has a complete layer system. You can add layers, delete them, rearrange them, make them visible or invisible and lock or unlock them. You can also assign an opacity and a blend mode to a layer. You can assign an opacity (degree of transparency) to individual objects and to groups. ZeusDraw supports the standard Adobe blend modes. Even with anti-aliased drawing, thin lines sometimes show artifacts on the screen. ZeusDraw's new SoftEdges eliminate most of the artifacts making it more pleasant to draw on the screen and prepare artwork meant to be viewed on-screen. With ZeusDraw 100% means 100%. If you draw a one inch long line it will be very close to one actual inch long on the screen, rather than about 3/4 inch as with many other programs. This helps in visualizing how your design will look when it is printed. Designing a banner or billboard? ZeusDraw will work for you. There are no limits on the size of your design. You can e-mail either an area of your design or selected objects from within ZeusDraw. Works with Apple Mail, Eudora, MS Entourage or the AOL mail client. Use the ones that come with ZeusDraw or create your own. ZeusDraw gives you tiled printing and tiled pdf/PostScript output of any size area of a design with a tile size that you choose. ZeusDraw can create jpeg, png, tiff, gif and bmp bitmaps at any resolution and pdf/PostScript files of any area of your design. You can choose to export the selection, the page bounds, your entire drawing or a specified area. New — You can choose the color model when exporting bitmaps. (RGB, CMYK or Grayscale for tiff or jpeg, RGB or grayscale for png.) The exported bitmap's color model does not have to be the same as the document color model. Copy selected attributes from on object to another. ZeusDraw has a standard Macintosh Help Book. You don't have to be online to read it. Download a trial copy of ZeusDraw. This is a 30 day, unrestricted trial. To purchase a license for ZeusDraw, go to the Chromatic Bytes online store.